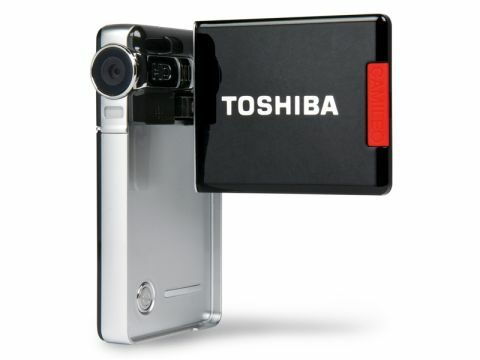 It may look like an elegant cigarette case, but the Toshiba Camileo S10 packs in a lot of HD capability. For all its back-pocket scale, it feels a little unwieldy in the hand, although most controls can be activated without difficulty. There's space for an SD card and a switch for selecting a macro stills close-up mode. The menus are brief and easy to navigate and offer options for adjusting exposure and choosing one of three pre-set white balance modes other than auto. We had to work hard to shoot any footage, as the S10 is neither intuitive nor responsive and the CD manual failed to answer many questions. Our mood wasn't lifted by the mediocrity of its pictures. A tiny lens can only do so much, and to be fair, the stills are not half bad for their colour reproduction. However, video playback looks as if it has been airbrushed and faces came out looking 15 years younger as a result. Unfortunately, the foggy, detail-free performance of anything shot without the supplied tripod in consistent lighting conditions does little justice to digital HD. That's why other models cost so much more while posting similar performance claims. The small sideways-pointing microphone reproduced reasonably cogent audio, but the reproduction is more akin to a walkie-talkie. With the huge potential offered by HD, don't be fooled into thinking you have got a bargain. Given the highly competitive market, its £150 price is not necessarily in the spirit of giving.